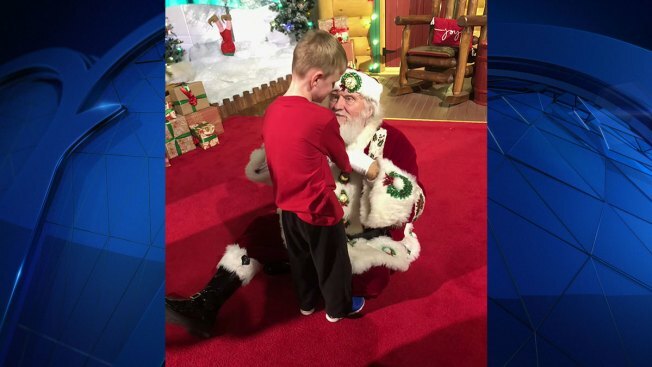 A North Texas family is opening up about a trip to see Santa they say they’ll never forget. "You appreciate it so much because he wasn’t supposed to do it, he wasn’t supposed to be here, he wasn’t even supposed to survive," Misty Wolf said. Wolf’s 6-year-old son Matthew was born 24-weeks premature and is both blind and autistic. Matthew has had a growing interest in Santa, and went with his family to see Santa earlier this month at the Fort Worth Cabela’s. "I kind of ran up to Santa and was like 'He is blind and autistic and very interested in Santa,' and Santa raised up his hands and said 'Say no more,'" Wolf said. What happened next has since gone viral: Matthew touched Santa’s beard and jacket and interacted with the man he’d heard so much about. "He’s never seen a reindeer, he’s never seen a picture of a reindeer so the thing is let him feel one," said "Santa." Wolf said it was a moment that meant more to her than any present and one she knows Matthew will forever appreciate. "I stood there with my eyes all glassy from tears welling up inside because I was just excited for him to put that together," she said.